At the proposal’s public hearing in May 2012, Wayne Turett, of Turett Collaborative Architects, presented Schnall’s plan. The building would have a 75-foot-wide, one-story base, with the 60-foot-wide upper floors aligned to the eastern lot line. This would create a 15-foot shaft to provide access to light and air to a neighboring building to the west as required by a property easement. The building’s front facade would be framed in painted metal and feature an asymmetrical, staggered pattern of translucent channel glass with loft sized windows. The penthouse would be clad in a lighter shade of painted metal. The building’s sidewalls would be clad in gray brick. Four garage entrances, made of a mixture of opaque and translucent glass panels, would be built at the ground level, with a central recessed pedestrian entrance in the middle. A steel-and-glass awning would be installed above the ground floor. According to Turrett, you would not be able to view the building’s interior through the channel glass, but the material would glow from the interior lighting at night. Manhattan Community Board 1 opposed the proposal. 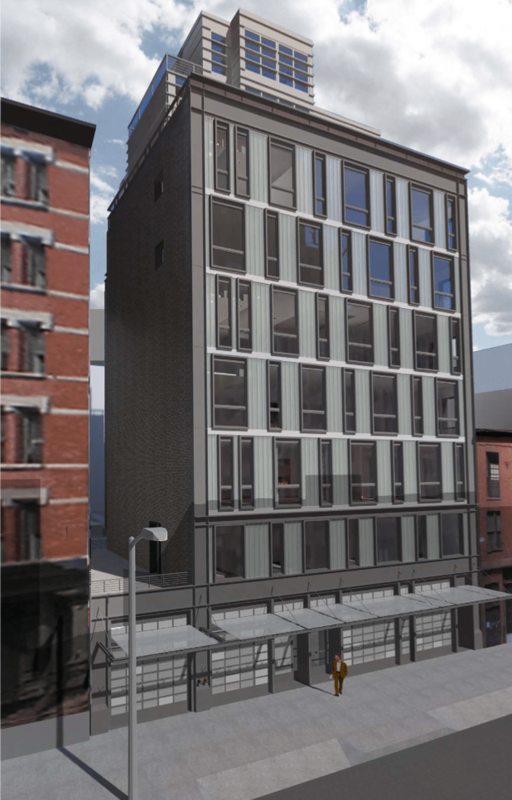 In its resolution recommending disapproval of the proposal, CB 1 objected to the building’s “clumsy” massing, “stark” channel glass, gray brick sidewalls, and garage entrances. Steven Schnall responded to the testimony, stating that the block consisted of various building heights, and claimed that his building would “fit in contextually.” Schnall argued that the previous project should not limit the height of a future project. He claimed the thick channel glass would mute the building’s luminosity, and would not be analogous to the New York Law School’s building nearby, which features standard glass in front of fluorescent lights. Commissioner Fred Bland found that the proposal’s massing was contextual, but said that there was an “overall clumsiness” to the building. Bland said the staggered windows were “an almost tiresome trend” and inappropriate in the district, and he was not sure he could support the use of channel glass. 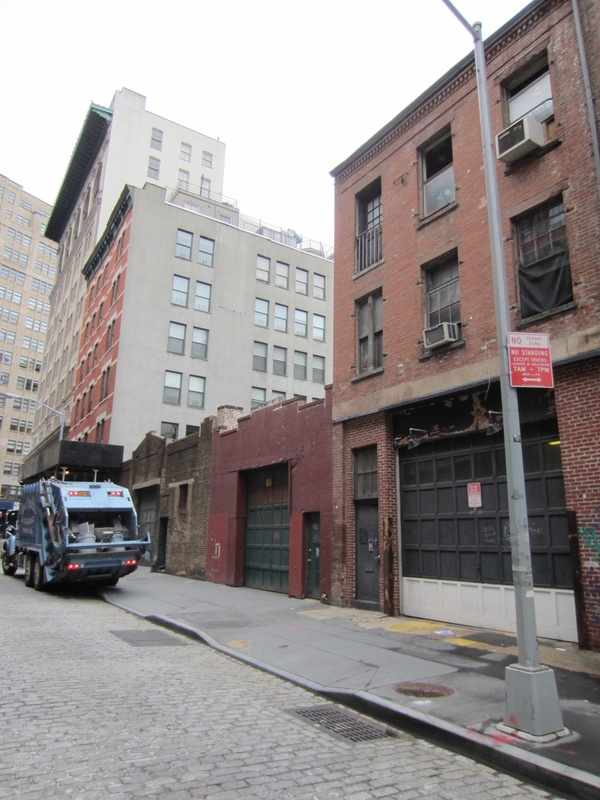 Commissioner Michael Goldblum said the penthouse was one-story too large and too close to the front facade and registered objections to the “blank” garage doors. Commissioner Michael Devonshire determined that the proposed design would strike a “very discordant note” on the block. Chair Tierney asked the applicants to return to Landmarks with a revised design. Schnall returned in June with a revised design featuring a more regularized window pattern. Red brick would replace the gray brick on the sidewalls and frame the front facade. The first level of the penthouse would also be clad in masonry, while the upper level would remain clad in metal and glass. While the proposal’s overall height remained the same, the penthouse would be set back further, although still visible from the street. One of the garage openings was eliminated and replaced with storefront infill. The commissioners found that the changes were moving the proposal in the right direction, but still found the penthouse’s bulk excessive. Chair Tierney asked Schnall to reduce the bulk, possibly by removing the top floor of the penthouse. Schnall came back to Landmarks in July with additional revisions. The building would retain the two-story penthouse, but its bulk was reduced by eliminating a portion of the penthouse and pushing it 22 feet away from the eastern lot line. Chair Tierney called the revised plan “completely responsive” to Landmarks’ concerns, and the other commissioners agreed. Landmarks voted unanimously to approve the proposal. LPC: 15 Leonard Street, Manhattan (13-0491) (July 17, 2012) (Architect: Turett Collaborative Architects).